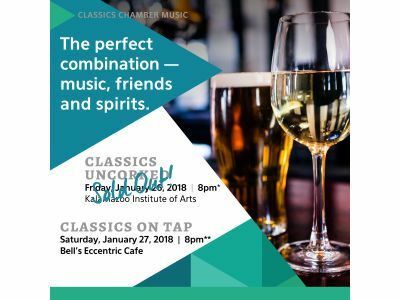 Kalamazoo, MI January 10, 2018 – The Kalamazoo Symphony Orchestra presents the first two concert pairings in its popular chamber series—Classics Uncorked and Classics On Tap. KSO’s classics concerts feature an evening of chamber music favorites played by smaller ensembles of orchestra musicians. The concerts in the KSO’s Classics Series allow patrons to become better acquainted with classical music and KSO musicians in a more social and relaxed atmosphere. The concert will open with Johannes Brahms Clarinet Sonata No. 2 in E-flat Major, Op. 102, No. 2 featuring KSO Principal Clarinet and KSO Artist in Residence, Georgiy Borisov, and Reiko Yamada, Principal Keyboardist on piano. Following this Brahms piece, Interim Music Director and Resident Conductor, Daniel Brier, will perform two violin sonatas - Violin Sonata No. 1 (1958) by George Walker and Violin Sonata No. 1 in G minor, Op. 78 by Johannes Brahms. Mr. Brier will be joined by Reiko Yamada on piano. The program will close with Clarinet Quintet in F-sharp minor, Op. 10. Joining Georigiy Borisov for this piece for quintet will be the KSO’s ever popular Burdick-Thorne String Quartet. The quartet is comprised of KSO principal musicians, Julia Neckermann and Lisa A. Williams (violin), Grace Byrd (viola) and Igor Cetkovic (cello). Savor your favorite Bell’s beers while you relax and enjoy an evening of chamber favorites. Come early to purchase your beverages and settle in for this evening of warm and wonderful music. Tickets are selling quickly for this new program so call now to reserve your seats. You must be 21 to enter!